Before he began his presentation, Pennsylvania state trooper Clifford Greenfield gave a disclaimer: “Please note that the information contained herein is not designed to scare, produce unforeseen paranoia or cause undue worry.” Then he told a group of educators and administrators how to prepare for the possibility of an active shooter. Greenfield’s was one of more than two-dozen presentations at a school safety symposium held in Indiana, Pa. last week that drew nearly 600 educators, superintendents, school resource officers, state police, and community members from around the state. But the focus on Friday was on prevention. Indiana Area superintendent Michael Vuckovich, who organized the symposium with Dr. Timothy Runge of Indiana University of Pennsylvania, said he sees a growing need for preventative measures against school violence. School districts have a lot of discretion in how they approach safety and security. All Pennsylvania districts are eligible for $25,000 safety grants per year, which they can spend on anything from counselors to metal detectors. This year, the Indiana Area School District spent its $25,000 on “soft” solutions, such as a curriculum for promoting alternative thinking strategies and reinforcing positive behavior, and extra school psychology resources. Other districts have chosen to spend their state grants on school hardening. Chestnut Ridge Superintendent Mark Kudlawic, who drove 60 miles to attend the conference, said his rural district used its $25,000 to hire an armed school police officer. Next year, he wants to use the money for an ID-scanning system. 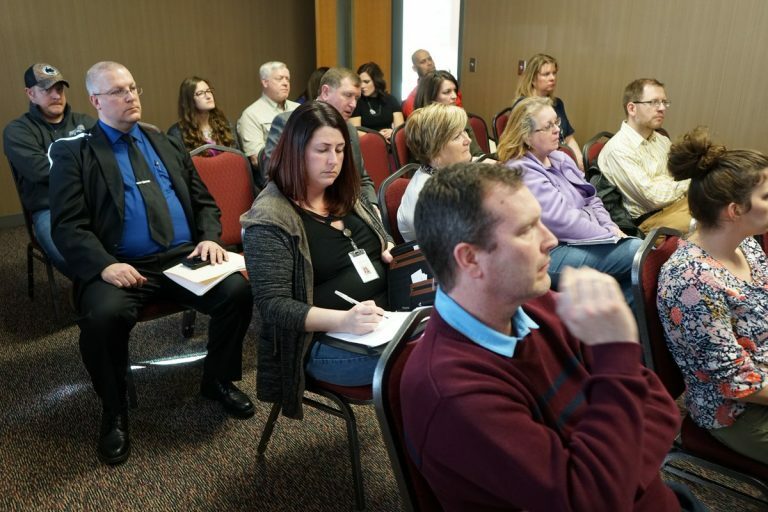 Educators came from around the state to hear suggestions and gather information they could bring back to their own districts, some coming from as far away as Chester County in Southeastern Pennsylvania. Teacher Chuck Kustan drove three and a half hours from Nativity BVM High School in Pottsville. He serves on his school’s safety committee and spent the day in sessions focused on cultural competency and school climate. Wendy Jasper, a science teacher at Blairsville High School in Indiana County, attended sessions that ran the gamut, from a presentation on “run, hide, fight” — an active shooter response program — to one on social and emotional learning. She said she doesn’t know if she’ll ever feel prepared enough for the possibility of violence against her students. “I want to teach them science, and now I have to learn how to send them home to their parents. 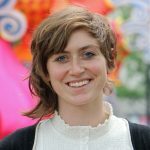 And that’s a heavy topic, and a heavy responsibility, and not one I take lightly,” she said. Community members also attended the symposium, including Lillian Clemons, who has nieces and nephews in Indiana Area schools. 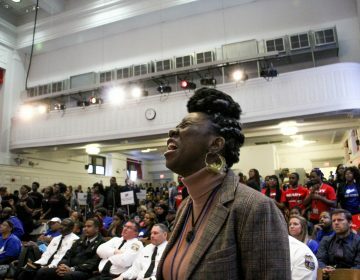 She attended a session about armed personnel, from security guards to teachers. She said she is split on the issue of armed staff because of “the hardship if you have a mistake” and staff shoot someone accidentally. “On the other hand, you have to be protective of the other students too,” she said. In that session, attorney Ronald Repak attempted to clarify the shifting legal landscape around armed school personnel. Generally, school districts have two options: school resource officers, or school police officers, each of which are appointed through a different process and have different scopes of practice. (For example, school resource officers may file criminal charges, while school police officers can only detain suspects until police arrive.) Both may be authorized to carry firearms. Last month, the Pennsylvania Department of Education issued a memorandum clarifying that a third group, school security officers — contractors hired by a school district from an outside firm — cannot carry firearms in school. It’s a fine-toothed distinction. In practice, it means that schools with certain types of security officers may have to disarm them. Repak, whose firm Beard Legal Group represents school districts, said he thinks that’s a dangerous idea. “Everyone is going to know that this person who once had a weapon no longer has a weapon. To me, it creates a real sense of a security issue breach,” he said. Repak also said his firm has petitioned district attorneys on behalf of school administrators who wish to carry concealed firearms in Pennsylvania schools. Some superintendents have been given permission to do so, and Repak said they have no legal obligation to tell the public. He also said that according to his interpretation of the law, it may be legal for schools to arm teachers, referencing the Tamaqua Area School District in Northeastern Pennsylvania, which is the first in the state to try to do so. Elsewhere in the building, very different conversations were taking place. Randall Fox of the Pennsylvania Center for Safe Schools presented on how teachers can integrate social and emotional learning into their classrooms, teaching students to be resilient and to support each other in the face of bullying. “I don’t know why we call these soft skills. I think they’re very strong skills,” he said. He spoke about programs such as Aevidum, which started in Lancaster County and teaches students to stand up for one another. The Indiana Area School district has been prioritizing social and emotional learning in recent years. “We’re going in the right direction, is what I’m hearing,” said elementary teacher Laura Lansberry, who attended the session. “And we’re not alone in it,” said fellow elementary school teacher Katie Woodrow. Vukovich said while he thinks preventative measures are the bedrock of school security, he thought it was important to bring educators together to talk about the worst case scenario, too. As Trooper Greenfield pointed out in his presentation, active shooter incidents have only increased in recent years, a point grimly underscored by the attack on two mosques in New Zealand on Friday. 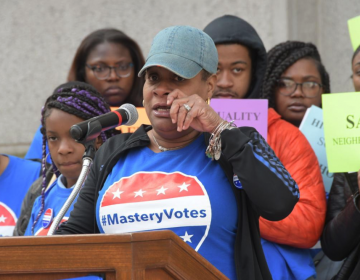 The Mastery Parent Action Team rallied at City Hall Thursday morning. The group met with Philadelphia Police Commissioner Richard Ross and other city leaders. A woman who lost her daughter in the Connecticut elementary school massacre still steels herself to tell the story. She does so to help others prepare for the next tragedy.